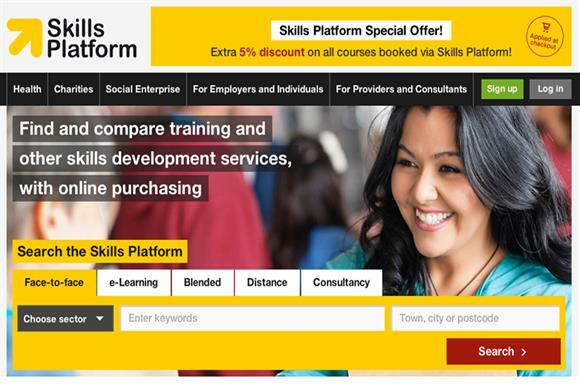 Skills Platform, a government-funded online training and development resource for the charity, social enterprise and health sectors, has been launched today by the sector skills council Skills for Health, a registered charity. Skills Platform gives charities and health sector organisations advice and guidance on sourcing, comparing and purchasing training and related consultancy services. The platform was originally developed by Skills Effect, the charity sector’s now defunct sector skills council, which was formerly known as Skills - Third Sector. In April 2013, Skills Effect secured £1m from the UK Commission for Employment and Skills, an executive non-departmental public body, to develop the platform. It was initially launched to the charity sector in a pilot in December 2013, according to Keith Mogford, development director of the platform and previously chief executive of Skills Effect. Mogford said it then became clear that the platform’s future would be best secured outside of the ownership of Skills Effect. He told Third Sector: "We got to a point in April or May 2014 where we had started to get some inquiries from other sector bodies about whether this might work for them as well as the third sector. "Skills Effect was a relatively small charity, and it was clear to the trustees that for the platform to develop and add value to other parts of the economy as well as the third sector, it would be enhanced if it was taken over by a larger organisation." The transfer of ownership to Skills for Health happened in July, and included Mogford moving to his new role. Skills for Health has since been given a further £280,000 from the UKCES for the platform’s further development. John Rogers, chief executive of Skills for Health, said: "Skills for Health recognises the hard work that Skills Effect, UKCES and the wider third sector have invested in the initial development of the Skills Platform. We are keen to take the platform to the next level of its expansion and to ensure we build on the solid foundations created by Skills Effect. The Skills Platform has a huge potential to revolutionise collaboration in training and development across the third sector, the health sector and beyond." According to its accounts for the year to 30 September 2013, Skills for Health had income of £15.5m, and a total of 83 staff. It is one of the 18 sector-skills councils and five sector-skills bodies, a number of which are charities, which are overseen by the Federation for Industry Sector Skills and Standards. Skills Effect still exists as a legal entity registered with both the Charity Commission https://www.gov.uk/government/organisations/charity-commission and Companies House but has inactive since the transfer of Skills Platform. Mogford said that its trustees were working towards its closure. It had income of £554,000 and seven staff in the calendar year 2013, its accounts show.